The Museum’s collection contains more than 17,000 fine and decorative works of art dating from the 18th century to the present. The collection includes paintings, sculpture, prints, photography, glass and ceramics, artists’ books, furniture, and much more. Works by artists such as Frederic Edwin Church, Marsden Hartley, Winslow Homer, Rockwell Kent, Louise Nevelson, John Singer Sargent, Andrew Wyeth, and Marguerite Zorach showcase the unique artistic heritage of the United States and Maine. The major European movements, from Impressionism through Surrealism, are represented by Mary Cassatt, Edgar Degas, René Magritte, Claude Monet, Edvard Munch, Pablo Picasso, and Pierre-Auguste Renoir, among others. Open: Daily from 10 am to 5 pm; Friday open until 9 pm. 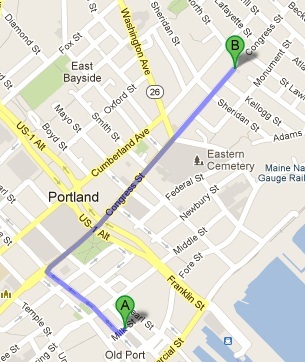 From the Regency Hotel (A on the map), it is a 0.6 mile walk to the Portland Museum of Art (B on the map). The Wadsworth-Longfellow House is the childhood home of 19th-century poet Henry Wadsworth Longfellow. 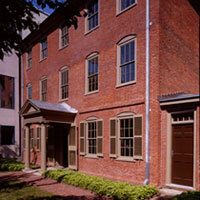 It is located on the campus of the Maine Historical Society, the third oldest historical society in the United States. The house was built in 1785 and was the first wholly brick dwelling in Portland. Guided tours of the Longfellow House, decorated with original furnishings and family memorabilia, offer a unique glimpse into the life of the poet and his family, as well as into the cultural and social history of 19th century Portland. Longfellow’s poetry and the context of his work are woven throughout the presentation. Behind the House you will find the Longfellow Garden, a secluded Colonial Revival style garden that is an oasis of green and quiet in the heart of downtown Portland. Located on what had once been the domestic farmyard for the Wadsworth Longfellow family, the Longfellow Garden Club created the garden in 1926. Beautifully landscaped, with meandering paths throughout, it is open to the public in seasonal weather. 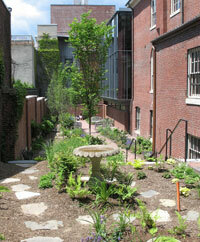 The House and Garden are open daily in the summer and are located at 489 Congress Street. House tours last about an hour. From the Regency (A) is is 0.5 miles to the house (B). Children: $3, under 6 free. Note that the Portland Museum of Art is just a few blocks further to the west on Congress Street. It would be feasible to combine a visit to the Longfellow House and art museum into one outing. Cryptozoology: The study of hidden or unknown animals such as; Bigfoot, the Loch Ness Monster and Yeti. Come visit the only museum of its type in the world! Over 50 years of collecting by Loren Coleman are displayed in the ICM. Let it be your gateway to adventure. Admission for adults is $7.00; children 12 and under are $5.00. All children must be accompanied by an adult. 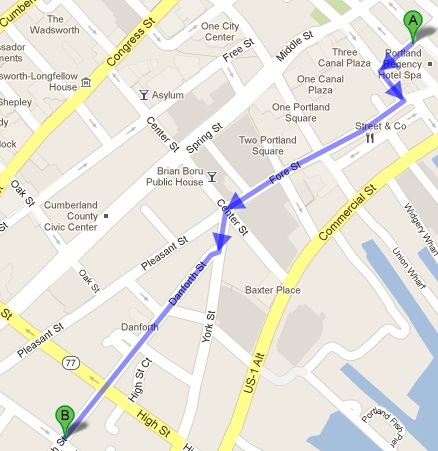 From the Portland Regency Hotel (A), it is less than a one mile walk to the museum (B). Described as “Captain Moody’s gift to Portland,” the Portland Observatory offers spectacular views of the harbor and islands. Built in 1807, the Observatory was declared a national landmark in 2006. It is the only known remaining historic maritime signal tower in the United States. Guided tours are available daily in the summer. Doors open at 10:00 am. All visitors are guided to the top with tours generally on the hour with the last tour at 4:30 pm. 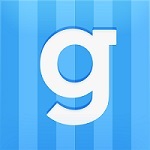 (Allow 45 minutes) Please Note: We provide guided tours only. This is for the safety of visitors and the protection of the building. We regret we cannot allow unsupervised visitations. Please note that there is universal access by lift only to the first floor. 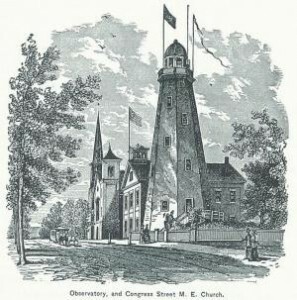 The Portland Observatory (B) is at 138 Congress Street and is 0.9 miles from the Regency Hotel (A). Victoria Mansion, also known as the Morse-Libby House, is the finest example of residential design from the pre-Civil War era in America. With superb architecture and well-preserved original interiors that were among the most lavish and sophisticated in their day, it is an unparalleled document of America’s highest aspirations in architecture, interior design, and the decorative arts. 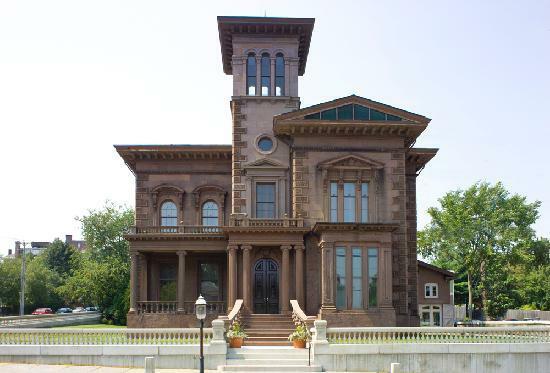 Our history, a quick tour, and our present-day efforts at restoring the Mansion convey an impression of the significance of this unique site, which is of national and even international importance. From the Regency Hotel (A) it is a 0.6 mile walk to the Victoria Mansion (B).